September 11, 2001. Terrorists attack the United States. 2,996 people died. The economic damage was more than 250 billion dollars. The 9/11 Commission Report made 46 major recommendations in 8 categories. Virtually all the recommendations were implemented. Allocate more radio spectrum and improve connectivity for public safety communications, and encourage widespread adoption of newly developed standards for private-sector emergency preparedness—since the private sector controls 85 percent of the nation’s critical infrastructure. On December 29, 2017, the First Responder Network Authority (FirstNet) became a reality in all 50 states, the District of Columbia and two United States Territories. FirstNet was created by Congress on February 22, 2012. Congress allocated 20-megahertz of radio spectrum for FirstNet’s use in creating a nationwide mobile wireless (cellular) network where first responders will have priority. Congress stated FirstNet must use long-term-evoluation (LTE), a worldwide standard, for the network. And, while many public safety responders work for governments, there are private sector first responders too, protecting critical infrastructure, who will have priority on the network. AT&T won a competitive contract to deploy the network, and promised priority on all its existing LTE spectrum, as well as the 20-megahertz assigned to FirstNet. AT&T delivered on that promise on September 30, 2017. But the Governor of each State and Territory, and the Mayor of D.C., each had to decide whether to participate in this network. On December 28, 2017, California became the 50th state, and 53rd government (including D.C., Puerto Rico and the U.S. Virgin Islands) to decide to participate in FirstNet. Thousands of Chiefs of fire-and-rescue, law enforcement, emergency medical services, and 9-1-1 centers advocated for FirstNet to happen. Hundreds of federal, state and local officials worked on the details, and hundreds of AT&T employees brought it to fruition on the carrier’s existing infrastructure. The vision of the 9/11 Commission is, at long last, 5,953 days later, realized: a nationwide public safety communications network. Still, there is much to be done. New advances in technology and therefore terrorist, criminal and public safety capabilities are constantly occurring. Hacking, cybersecurity, new smart phones, the Internet of Things, body-worn video cameras, new applications, unmanned airborne vehicles, natural language processing (Siri, Alexa, Cortana) and artificial intelligence are just a few of those advances. Public safety agencies often lag in adopting these technologies to support their mission of keeping 320 million Americans safe. While one of the last chapters of the 9/11 story is now closing, many new challenges and opportunities present themselves. The contract for FirstNet has a 25 year life, starting March 30, 2017. There are 8,859 days remaining. Many challenges still remain to be completed: public safety agency adoption of FirstNet, an applications store filled with innovative apps, the Internet of Life-Saving Things, cybersecurity, network connectivity in remote areas and more. Nevertheless, our nation’s first responders now, on December 29, 2017, finally have a nationwide wireless network with priority for their smart phones, mobile data computers, tablets and other devices. CES, formerly the Consumer Electronics Show, recently concluded in Las Vegas. Alexa conquered the show (Wired), and seemed to be everywhere (Fast Company). Alexa is, of course, the voice-activated digital assistant developed by Amazon, headquartered in Seattle. Alexa has a long and growing list of commands ranging from “Alexa Shut Up” to “Alexa Give me a Game of Thrones Quote” to skills commands like “Alexa Ask Lyft for a Ride” which enables a specific skill written by Lyft to engage their car-sharing service. Alexa is being married with a new generation of “smart devices”. So if your light bulbs are smart enough, Alexa can control them (“Alexa, turn off the lights in the bedroom”). If your garage door is smart enough, Alexa can open it. Audio equipment. Smart phones. Even cars (Ford is building Alexa into its vehicles) will have Alexa controls. Indeed, Shelly Palmer, a long-time observer of CES, says “anything which can be connected, will be connected” to Alexa. But what happens when you say “Alexa, call 911”? Right now, of course, nothing. Alexa cannot use the telephone, or make a phone call. But, it can – and does – send data and your voice across the Internet to the Amazon cloud. And, as Amazon develops Alexa’s expertise, it is only a matter of time until such a “call 911” skill is built. Anyone who has been a victim of a crime understands the potential for using Alexa to call 911. Someone breaks into your house, and you fumble to find a phone and fumble to unlock it and then punch in 911. But Alexa is “always on, always listening”. You simply say “Alexa, call 911”. But then what happens? Does Alexa “keep the line open” so you can talk to the 911 operator? What if you have to leave the room or get out of Alexa’s range as you retreat into a closet or try to find the burglar? Should an individual Alexa device in one room automatically activate all the other Alexa devices (Echo, Dot, Tap, Firestick etc.) everywhere in the house and put them on the line with the 911 operator? FirstNet will be deploying a nationwide cellular network for first responders and their smart phones, mobile and tablet computers. With FirstNet, responding officers could actually connect, as they are responding, with such inputs – video cameras and Alexa devices, so officers could hear and see what is happening inside the house. There will also be Alexa-enabled vehicles. Could an Alexa-enabled vehicle become somewhat “self aware”, so it might detect that it is being hotwired – that its owner is not present, and call 911 to alert police of the crime-in progress? Or perhaps the car would detect that its windows are being broken, activate tiny video cameras around the car, and also, with Alexa, alert the 911 center to that car prowl in progress. But some 911 emergencies are not crimes, but a fire. The urgency of a quick connection to 911 is underscored in a fire, as people need to call 911 and get out of the premise quickly. Alexa-capable devices will eventually connect to fire alarms and sensors in the house. Perhaps, eventually, people will also have sensors in their clothes so Alexa could also precisely locate people inside a house. These devices will eventually have GPS beacons so their locations are precisely known. All of this information could be available to responding firefighters so they could see the location of the fire and potentially the location of every human being and pet inside the home, invaluable information for saving lives in the first few seconds after firefighters arrive. Many 911 calls are medical emergencies – diabetic shock or a heart attack or a stroke or a fall. Again, Alexa will be invaluable in summoning aid. An elderly neighbor of ours recently fell out of bed and shattered her femur. She slowly, painfully, crawled to a phone to call us (and we called 911). But with Alexa, all she would have to say is “Alexa, call 911” and she’d be immediately connected to aid. Again, biosensors are being embedded in humans today and this trend will continue. Heart pacemakers, insulin pumps, glucose monitors, blood pressure monitors are all devices we attach to our bodies to monitor our health. These devices could eventually be controlled by Alexa, or at least send information to Alexa, which would establish a history and pattern which could be invaluable to the paramedic responding to 911 calls. With “Alexa call 911” plus FirstNet all of that information could be sent to emergency medical technicians and emergency room physicians at hospitals before the Medic unit even leaves the station. In fact, the potential for such live-saving applications could, eventually, lead to a mandate that all voice-activated digital assistants in a home must have the capability to call 911 just as today every cell phone – even if you haven’t paid the bill in years – are mandated to connect 911 calls to a public safety answering point. Just as Alexa’s potential for saving lives and solving crimes through 911 calling is the “bright side”, there is also a “dark side” of enabling this capability. The most immediate effect will be on understaffed 911 centers. The sheer number of 911 calls will rise. The quality of the calls may also drop as people try to talk to their voice enabled devices as they move from room-to-room, making it hard for 911 operators to hear and interact with the caller. In fact, many Alexa-based 911 calls may become the equivalent of a “911 hang up” call today, where officers are dispatched out of concern that domestic violence or another crime is occurring and the caller is unable to reconnect with the 911 center. In addition, Public Safety Answer Points (PSAPs) may become overloaded with data during these calls. Security companies, certainly, will rush to develop Alexa-enabled products. These could be video cameras placed around the home, coupled with movement sensors, heat/fire sensors, door and window sensors (to determine if a door/window is open or shattered), and so forth. Such a system would allow a homeowner to know the status of her home at any time or place. But all of this data could also be transmitted to a 911 center or (via FirstNet) to responders as they are en route. With the advent of inexpensive video cameras, the sheer amount of data (multiple video feeds, for example) would easily overwhelm a 911 center or responders. (Note: 911 centers presently only receive voice phone calls, although an increasing number call also receive text messages. Very few can receive photos, images, video and similar information from 911 callers). Today there is significant concern about the amount of data and information collected about individuals today through their use of the Internet and social media. The advent of voice-activated digital assistants and homes of sensors increases those concerns. Shelly Palmer has written “How Dangerous is Alexa”, an exploration of the potential for these devices to collect vast amount of information about us simply by listening in the background, as well as by the control of our other smart devices. Beyond the data collection is the potential for hacking these digital assistants – or the smart devices they control. The Mirai Botnet incident of September, 2016, clearly demonstrated the power of such hacking. We can imagine many frightening scenarios, such as criminals hacking into a home’s smart devices and directing them to open all the doors and windows to simplify a burglary. Worse yet, a criminal syndicate or a hostile nation state might direct all the Alexas (or other digital assistants) in a city or state to “call 911” overwhelming first responders and throwing a nation into chaos. “Alexa, Call Nine One One”. Five simple words which carry such power, such potential for improving public safety, solving crimes and rushing aid to victims of fires and health emergencies. Five simple words which raise numerous issues about the staffing preparedness of our 911 centers and public policy which our elected leaders will need to address. The social workers and case workers of the future probably reside in our schools and police stations, carry gradebooks and body-worn video cameras, walk the halls of schools and the streets of our cities. Good teachers rapidly learn to “out-psych” their students and trick them into learning. I’m not talking about the advanced placement classes, mind you. Anyone can teach advanced placement English or high school calculus. But trying to teach a classroom of C and D students basic English grammar is a challenge of a different order. Good teachers rapidly develop techniques to control the class and actually make students interested in the material. Similarly police officers – especially detectives – develop techniques to help discover concealed information from suspects and informants – even witnesses – and use it to solve crimes. Social work, however, is becoming a new calling for teachers and police officers. The school’s guidance counselors serve as de-facto social workers, fielding requests for help with utility bills and eviction notices — even dealing with bedbugs and moldy apartments. They usually find a way. Teachers have long recognized that effects outside of the classroom have a huge effect on learning. Angry, abusive parents, hunger, homelessness, fear, even out-of-date (“uncool”) clothing all affect students’ ability to learn. In the past educators and schools felt there was little they could do to affect such outside influences. School lunch programs were an early intervention, instituted before World War II, to address the issue of hunger in schools. Some schools implemented uniforms to reduce social inequity between students which prevents learning. Schools such as Foster take this intervention to a new level, actively seeking those factors which distract students, and working with parents and social service agencies to address them. Perhaps individual teachers are not becoming social workers, but certainly they are at the forefront of seeing problems with learning and helping to identify specific problems with individual students, so guidance counselors and others can intervene. Similarly, many police departments are trying to move from a “warrior culture” to more of a “guardian” one. Former King County Sheriff Sue Rahr, now executive director of the Washington Criminal Justice Training Commission, has been a leader in such a cultural shift. Part of the “guardian” idea is that police officers’ jobs are not just to apprehend criminals and catch members of the public doing something wrong (speeding), but rather to help determine and correct the underlying causes of crime in individuals and families. The Seattle Police Department, among others, has been at the forefront of this cultural shift. 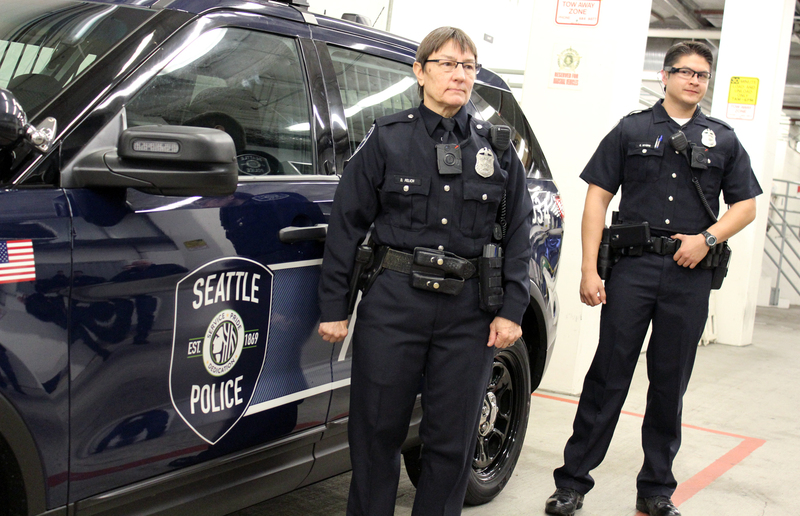 Every Seattle Police Officer has received at least 18 hours of crisis intervention training. More than 400 officers have received 40 to 80 hours of such training. When police officers encounter people in crisis – specifically the mentally ill or homeless individuals who are potentially at risk – they attempt to engage social services to address their physical and mental health needs. For individuals who police frequently encounter, the Crisis Intervention Team is building an individual Crisis Intervention Plan, which includes resources such as their caseworker, social worker, concerned family members and others who can be engaged to immediately help the individual. Every such encounter is logged. Sometimes an individual is violent, or armed, or so mentally impaired that officers have no choice but to use force and the result is jail or a mental ward. But less than 7% of encounters end in this fashion. Fire departments also encounter people in real or imagined medical crisis. One woman called 911 in Washington D.C. for medical help 226 times in a single year. Another study found that 14 to 27 per cent of calls to 911 for medical reasons are really not emergencies and could be handled in doctor’s offices or walk-in clinics. A third study found that 1% of “frequent flyer” users account for 22% of the health care costs. 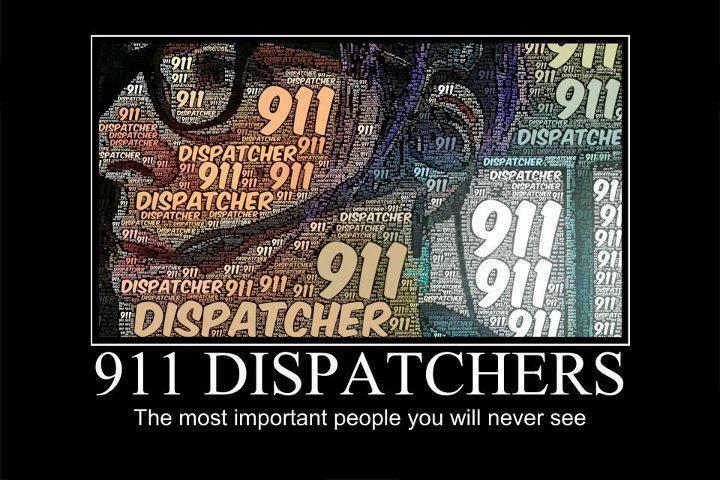 Salt Lake City addressed this with a “Nurse Navigator” program – a trained nurse-dispatcher handles low-acuity 911 medical calls, attempting to find the proper resources, other than a fire department paramedic and ambulance – to address needs of some frequent callers. I’m not sure where these efforts will ultimately lead. Perhaps every American will, to some extent, become a social worker. This actually would take us “back to the future” – back to a time when families and communities “took care of their own” before a time when government was expected to be the first line of attack for social problems. But I hope the new equilibrium we reach does not abandon government programs all together, but rather involves most government workers – especially teachers and cops and firefighters – as “guardians” of the social fabric, yet keeps many critical social programs such as Medicaid, food stamps, school hot lunches and housing subsidies in place. Of course there will always be hardened criminals, and evil people, arsonists and people so mentally unbalanced that they need to be institutionalized. We’ll still need jails and mental hospitals and professional “guardians” of our social fabric. But, with a little bit of luck, every American will become more involved again in taking care of our neighbors. Can Police BodyCam Video be Public while protecting Privacy? You have a serious car accident. The police arrive and investigate. They issue a citation and write a report. The officers are wearing body-worn video cameras and their cars have dashcam video. At the end of the event the officer gives you a code. The next day you go online to the police department’s website, key in the code and all the materials regarding the collision are available to you – the videos, with a written transcript, the officers’ reports, the citation, the sketches and photographs of the accident scene, witness statements, and perhaps a history of other collisions and problems at that intersection. 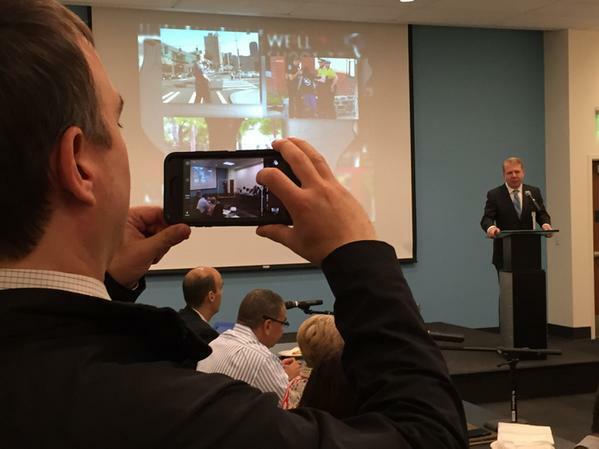 That’s one vision laid out at a body-cam video workshop hosted by the Seattle Police Department on Tuesday, June 23. The event included officers from the Orlando, Louisville and Dallas police departments, plus representatives of the Police Foundation, Code for America and Socrata, the Seattle company which powers open data portals such as data.gov and data.seattle.gov. These organizations are all participating in the White House sponsored Police Open Data initiative, announced last month by the Obama Administration. “Policing is in a crisis,” said Seattle Police Chief Operating Officer (COO) Mike Wagers several times during the workshop. “Police are not necessarily using more force or making more mistakes,” he added, but there’s been a change in the technology available to the general public. “Two-thirds of adults in the United States will own a camera-capable smartphone by the end of this year.” Those smartphones mean there is more video than ever being taken of police-citizen encounters and uploaded to YouTube and similar sites. What’s the real future for police video? Can the privacy of victims, children and witnesses be protected while at the same time making this video public? Is it possible to “redact” or blur the faces and audio of such people to protect them yet release the video to the public? The rest of this article is on GeekWire here. See also the previous article discussing how Seattle Police held a hackathon in December, 2014, to find ways to redact video. Implementing a body-worn video camera program requires much more than just buying the cameras themselves – there is storage and indexing and search and making the video public and much more – here is a previous blog post discussing these issues. The “Internet of Things” or IoT is a common buzzword in the technology community these days. It refers to the increasingly prevalent distribution of sensors throughout the natural world, and the connection of those sensors – as well as other machines – to the Internet. The running joke is that IoT is about putting your home refrigerator, thermostat, washer, dryer, microwave, range, TVs, computers, smart phones and even toasters on the Internet, or at least connecting them so they can talk to each other. Now what a toaster would say to a TV, or what the conversations between a washer and a dryer might include, could certainly make for a lot of talk show jokes and lists on a David Letterman show (should he return). But clearly creating such an “Internet of Household Things” or IoHT would be quite useful. Take, for example, the urgent water crisis in California and throughout most of the West. If you could add sensors to every water fixture in the house, and then connect those sensors to computers and smartphones, you could determine where your water is being used and take steps to cut back use. Going one step further, if those water sensors also had valves, you could control your household water use from anywhere in the world. So when your teenager’s shower has gone over five minutes in length, you could abruptly get a notification and then shut off the water (or turn on the cold water full blast) from your hotel room in Hong Kong. How might this Internet of Things concept apply to First Responders – the paramedics and firefighters and police officers who respond to our 911 calls? I recently had a twitter conversation about this with Ray Lehr, former fire chief in Baltimore, and former FirstNet State Point of Contact (SPOC) for Maryland. Ray suggested we should start talking about the Internet of Life Saving Things (IoLST) which I morphed into a possible Internet of First Responder Things (IoFRT). First Responder Personal Things – the sensors and equipment which would be on or near a First Responder to help that officer do the job and keep the officer safe. 911 Caller and Victim Things – these sensors would help alert 911 centers and responders to problems so First Responders can quickly and accurately respond to calls for assistance. Information and Awareness Things – these sensors and machines would improve public safety by monitoring the natural and built environments. “First Responder Personal Things” would include a variety of sensors and communication devices. Body worn video cameras – so much in the news recently after the events in Ferguson, Missouri – are one example of an IoFRT device. Most such cameras today record their video and hold it in the device. But if wirelessly connected to the Internet (by, say, FirstNet), a police commander, 911 center and other authorized users could see the video in real time to advise and support the officer. A police officer’s badge or other apparel might have a small radio which broadcasts a signal unique to that officer, which allows many other communication devices (smart phone, radio, tablet computer) to automatically recognize the officer and therefore allow access to restricted databases such as criminal history. A similar situation for a paramedic would allow her/him access to restricted patient files and healthcare history. A police officer’s weapon could have a sensor which only allows it to be fired if it is personal possession of the officer. Firefighters – especially those fighting long, sustained, wild fires, would have an array of sensors to monitor heart rate, respiration, ambient air quality, etc., alerting the firefighter and incident commander to firefighters who are overworked or in dangerous situations. “911 Caller and Victim Things” would include those sensors on a victim or in their home or place of business which help to monitor and protect them. Medical sensors are an obvious application: people with a history of heart disease, stroke, diabetes or other conditions would have such sensors which would immediately alert them and their healthcare providers to impending problems. Such sensors might further alert 911 centers for dispatch of emergency medical technicians to an immediate problem. Vulnerable people in high crime areas might have sensors or video cameras which could be activated at a moment’s notice when they come into dangerous situations. Many homes and businesses are now equipped with video cameras, movement sensors and other sensors. A 911 call from the premise (or other activation by the owner) could give 911 centers and responding officer’s immediate access to the telemetry and video from those cameras. Finally, General Motor’s OnStar gives us a premonition of the technology which will go into vehicles in the future. Vehicles which communicate with roads or automatically notify 911 centers after an accident, to include transmission of telemetry and video are definitely in the future. “The Internet of Information and Awareness Things” is both more fascinating and frightening. Applications to support 911 response can be harnessed to many of these “things”. For example, Video surveillance cameras are becoming less expensive and more ubiquitous. Surveillance camera systems deployed by cities and counties receive significant scrutiny and attention from the ACLU and city/county councils such as the brouhaha surrounding Seattle’s attempted deployment of a $5 million system. 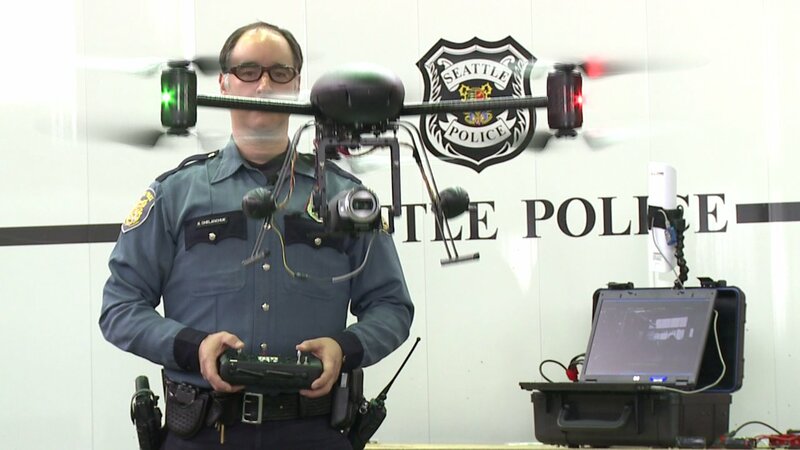 The use of unpiloted aerial vehicles with cameras is just starting deployment. But most such cameras are in the hands of businesses and private individuals, as demonstrated by the identification the Boston marathon bombers. Powerful new technology tools are becoming available for automated analysis of video, for examples automated license plate recognition, facial recognition and object recognition. We aid and abet this analysis by gleefully tagging faces in our Facebook photos, all of which Facebook uses to build its database of known faces. The largest license plate recognition databases are in private hands. In the near future every human being is likely to be recognized and tracked (and NOT by governments) whenever we are outside our own homes. In the wake of the 9/11 terrorist attacks, the Department of Homeland Security was created. Fearing potential chemical, biological and nuclear terrorist attacks, it deployed a network of sniffers and sensors in cities and other potential targets. Similar technologies and networks could be deployed to support first responders. For example, every load of hazardous material being transported by road, air or rail could be tagged and tracked. Every hazmat container stored in a building could also be identified and tracked, with firefighters watching them pop up on a tablet computer app when they respond to an event in the building. We could even tag every can of spray paint or every cigarette lighter as the combination of those two items, plus a healthy dose of stupidity (which, alas, cannot yet be tagged) contributes to major home fires like this one. 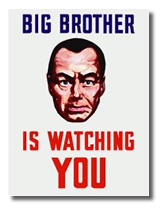 It is now easy to imagine a world like that depicted by George Orwell in his novel 1984, where surveillance is both nefarious and ubiquitous, fueled by a government (probably controlled by private companies) out of control. Like so many other choices faced by our early 21st Century society, the Internet of First Responder Things hold both great promise and some peril. Elected officials and chiefs of responder agencies will have many decisions to make over the next few years. In February, 2012 the First Responder Network Authority (FirstNet) was created and funded with $7 billion by Congress to build a nationwide wireless network for responders to daily incidents and larger disasters. I sometimes call it a cellular network to connect the smart phones and tablets of cops and firefighters, but, really, anyone who responds to disasters will probably be able to use it. FirstNet is required to consult with state governments about its plans, and then develop a design and plan for each state. This state plan will include what parts of the state will be covered, who can use the network in the state, and what the costs will be. FirstNet is starting to launch the consultation and design process, state by state. I was fortunate to be present on October 8th when FirstNet staff conducted their initial consultation with officials in the state of Oregon at the Department of Public Safety Standards and Training (DPSST) in Salem. Steve Noel, Oregon Statewide Interoperability Coordinator (SWIC) hosted the meeting. This is the third initial consultation of 56 states and territories where FirstNet will be constructed. The State of Washington is next up for an initial consultation, which occurs on October 16th. Here are a few of my impressions from Oregon’s consultation. I was most intrigued to hear real-world examples of communications needs from Oregon’s responders. Chief Mike Duyck from the Tualatin Valley Fire & Rescue, vice-chair of the Oregon State Interoperability Executive Council, eloquently spoke about the communications needs and possibilities of FirstNet. He spoke about “geo-fencing” physical addresses, so when responders were called to a specific address, they would know if people with arrest warrants or histories of violence lived or frequented nearby locations. He talked about crowdsourcing off-duty responders who are physically close to major incidents, video conferencing physicians from the scene of a medical emergency, and interconnecting traditional public safety land-mobile radios with smart phones and other cellular devices. All-in-all, his talk was an eye-opening vision of the future of public safety communications from an active, engaged fire chief. Cheryl Bledsoe from the Clackamas County 9-1-1 office talked about the combined use of land-mobile radio, cell phones and social media like twitter responding to the 2012 Clackamas Mall shooter. 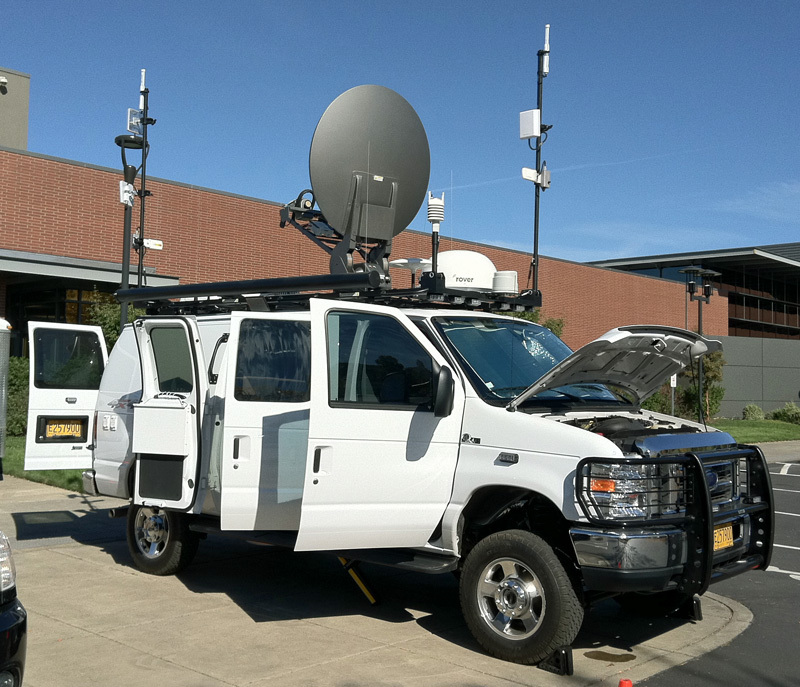 Some of Oregon’s first responders are actively adopting commercial high-speed mobile data networks for innovative use today. Sheriff Mike Winters, Sergeant Rick Kennedy and Jenny Hall from the Jackson County Sheriff’s department (tweeting here) brought their communications vehicle and demonstrated their use of wireless video. They showed live video from their communications center 150 miles away, and talked about the use of live video from helicopter feeds as well as fixed locations. They are hungry for more bandwidth and eagerly await the implementation of FirstNet to help with that. All Jackson County deputies use smart phones which include both GPS location (so they know where other deputies are located) and applications like an interconnection to their Land-Mobile Radio network. They also can access video from schools in the county (when authorized by the school). David Buchanan, Rich Reed and Brian Hobson led the FirstNet team meeting with Oregon. David has blogged about his observations here. I was impressed by the team’s attentiveness to the concerns of Oregon’s responders, and by their honesty. Rich Reed, FirstNet’s director of state plans, says “there are some things we know, many things we don’t know, and some things we believe” about how FirstNet will roll out nationwide. By coming to Oregon and other states they are hoping to expand the “things they know”. FirstNet staff emphasized again and again that the network needs to be self-sustaining – FirstNet has to find sources of income to match its operational costs and investment needs. At the same time it must be affordable to responder agencies, many of whom do not use commercial networks today, or only use them in a limited fashion. Oregon responders urged FirstNet to make the per-device cost equal to or less than the costs they presently pay to commercial carriers. Police Chief Rock Rakosi, chair of the Oregon SIEC, eloquently spoke about the need to provide coverage for rural agencies, even though there will not necessarily be significant income for FirstNet from a rural build-out. Some of those present in the room cited the need for subsidies for responding agencies with very limited budgets and potentially for volunteer firefighters or search-and-rescue volunteers. Rich Reed discussed the challenge of getting FirstNet’s band 14 chips into commercial devices. He noted the new iPhone 6 has 20 different LTE spectrum bands/chips but not Band 14. Karl Larson of the City of Portland raised the need for procurement contracts and vehicles in each state, so that cities, counties, state agencies and other responder entities could legally procure FirstNet services and devices. Brian Hobson said FirstNet has acquired Mentum Planet modeling software to help it design coverage for states. Each of the 56 states and territories who will be FirstNet partners has a “State Point of Contact” or SPOC. Steve Noel invited SPOCs from each state bordering Oregon to attend this event, and we all did: Rob Feeley of Idaho, George Molnar of Nevada, Karen Wong of California and my team from Washington. Another critical success factor is adoption by public safety agencies and other responders. According to FirstNet’s market research, sustainability is achievable as FirstNet doesn’t have to make a profit, support high overhead costs, pay spectrum licensing fees, turn a profit to (or satisfy) shareholders. (Schrier’s note: although FirstNet does have to satisfy its public safety user base, who are a tough crowd). I’m looking forward to FirstNet’s coming to Washington on October 16th to have a similar dialog with our public safety leaders and other responders. More details about that event on Washington OneNet’s website here. On June 3rd, Sue Swenson assumed the role of Chair of the FirstNet Board of Directors. She spoke to a group of about 500 people from public safety agencies, industry and the federal government at a conference near Boulder, Colorado, sponsored by Public Safety Communications Research (PSCR), an agency of the federal government’s Department of Commerce. Her prepared remarks are here. In Sue Swenson, FirstNet has found a fireball of a leader. Her remarks are refreshing. She admitted past Firstnet mistakes which have set back the effort. She’s willing to admit her own, past, misgivings. But she convincingly conveyed why she accepted the Chair’s role: this work is something which will make a difference in the lives of every American. And that same motivation drives the rest of us. Sue has a sense of urgency, but not emergency. I hate it when a tech employee comes to me and says “we have an emergency”. As a former cop my response is always “oh yeah, whose life is in danger?” Swenson feels the same way – unless someone has died, problems can be fixed. She’s obviously a “can do” leader. The FirstNet Board meeting yesterday was conducted in a room open to the public at a hotel. No more full Board meetings behind closed doors, with only a handful of people in the room, televised with grainy video and hit-and-miss audio. This is the way city councils and state legislatures and other public bodies meet – it is great to see the Board meeting that same standard. FirstNet staff, to a person, are open and engaging – in person, on the phone, via email. They ask questions, they ask for opinions, they answer questions honestly, understanding they only have a few of the answers. Most of FirstNet’s future is unknown – it is yet to be written. They, like Sue, are committed. FirstNet has promised a public comment and input process on major parts of its work, like a comprehensive network request for proposals (RFP) for equipment and services. The FirstNet website, while still rudimentary, contains hints of the new transparency. Features such as a blog give timely news. For example, FirstNet now has about 90 employees and contractors and we’re seeing announcements of some of those hires on the blog and website. In fact, FirstNet says they will accept guest blog posts from outside – and I’ll be taking them up on that offer! FirstNet encourages potential vendors to engage and meet with staff. This is extraordinarily important as it keeps industry engaged, keeps FirstNet informed as the technology changes, and gives even small vendors – like local independent telephone companies and tech startups – a chance to be heard. I’ve heard that, in the past, FirstNet staff listened politely to presentations but were forbidden to ask questions or engage. So this is a welcome change. FirstNet is highlighting best practices from states – work like a great poster developed by Oregon or a sharepoint site developed by Maryland. This indicates a true intention to collaborate and work with states. All is not sweetness and light, of course. It is still frustrating to hear a lot of talk about the “program roadmap” but yet only have a two-page executive summary which describes it. T. J. Kennedy, at the Board meeting, described some of the milestones – financial, personnel – which his team has met. But most of the roadmap is a really a fog to those of us on the outside. I admire retiring chair Sam Ginn, and thank him for taking on the responsibility – something he didn’t have to do – to launch this whole enterprise and get the FirstNet ball rolling and keep it rolling up some pretty steep hills. And I especially thank him for a phone call he made in mid-2012 to recruit Sue Swenson to the Board. I feel the same way – this network is owned by cops and firefighters and electrical lineworkers and building inspectors and EMT’s and telecommunicators who answer 911 calls every day. Like Sue, I’m just privileged to work on it.